"Verbatim: What Clarke Really Said, When He Said It"
"From the Archives, but Still News"
"A Comprehensive Strategy to Fight Al-Qaeda"? Washington, D.C., September 27, 2006 - In a series of recent public statements, Secretary of State Condoleezza Rice has again denied that the Clinton administration presented the incoming administration of President George W. Bush with a "comprehensive strategy" against al-Qaeda. Rice's denials were prompted by a September 22 Fox News interview with Bill Clinton in which the former president asserted that he had "left a comprehensive anti-terror strategy" with the incoming Bush administration in January 2001. In a September 25 interview, Rice told the New York Post, "We were not left a comprehensive strategy to fight al-Qaida," adding that, "Nobody organized this country or the international community to fight the terrorist threat that was upon us until 9/11." The crux of the issue is a January 25, 2001, memo on al-Qaeda from counterterrorism coordinator Richard Clarke to National Security Adviser Condoleezza Rice, the first terrorism strategy paper of the Bush administration. The document was central to the debate over pre-9/11 Bush administration policy on terrorism and figured prominently in the 9/11 hearings held in 2004. A declassified copy of the Clarke memo was first posted on the Web by the National Security Archive in February 2005. 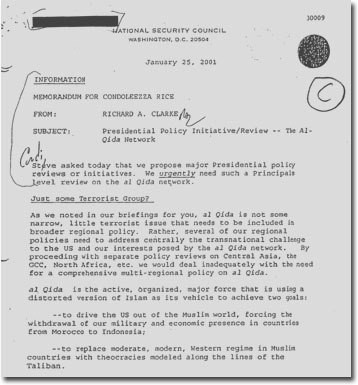 Clarke's memo, described below, "urgently" requested a high-level National Security Council review on al-Qaeda and included two attachments: a declassified December 2000 "Strategy for Eliminating the Threat from the Jihadist Networks of al-Qida: Status and Prospects" and the September 1998 "Pol-Mil Plan for al-Qida," the so-called Delenda Plan, which remains classified. CLINTON: And I think it’s very interesting that all the conservative Republicans, who now say I didn’t do enough, claimed that I was too obsessed with bin Laden. All of President Bush’s neo-cons thought I was too obsessed with bin Laden. They had no meetings on bin Laden for nine months after I left office. All the right-wingers who now say I didn’t do enough said I did too much — same people. CLINTON: What did I do? What did I do? I worked hard to try to kill him. I authorized a finding for the CIA to kill him. We contracted with people to kill him. I got closer to killing him than anybody has gotten since. And if I were still president, we’d have more than 20,000 troops there trying to kill him. Now, I’ve never criticized President Bush, and I don’t think this is useful. But you know we do have a government that thinks Afghanistan is only one-seventh as important as Iraq. And you ask me about terror and Al Qaida with that sort of dismissive thing? When all you have to do is read Richard Clarke’s book to look at what we did in a comprehensive, systematic way to try to protect the country against terror. And you’ve got that little smirk on your face and you think you’re so clever. But I had responsibility for trying to protect this country. I tried and I failed to get bin Laden. I regret it. But I did try. And I did everything I thought I responsibly could. The entire military was against sending Special Forces in to Afghanistan and refueling by helicopter. And no one thought we could do it otherwise, because we could not get the CIA and the FBI to certify that Al Qaida was responsible while I was president. QUESTION: By now I assume you’ve seen Bill Clinton’s performances. How do you respond to his specific accusation that the eight months before 9/11 the Bush Administration, in his words, didn’t even try to go after al-Qaida? SECRETARY RICE: I’d just say read the 9/11 report. We went through this. We went through this argument. The fact of the matter is I think the 9/11 Commission got it about right. Nobody organized this country or the international community to fight the terrorist threat that was upon us until 9/11. I would be the first to say that because, you know, we didn’t fight the war on terror in the way that we’re fighting it now. We just weren’t organized as a country either domestically or as a leader internationally. But what we did in the eight months was at least as aggressive as what the Clinton Administration did in the preceding years. In fact, it is not true that Richard Clarke was fired. Richard Clarke was the counterterrorism czar when 9/11 happened and he left when he did not become Deputy Director of Homeland Security some several months later. We were not left a comprehensive strategy to fight al-Qaida. For instance, big pieces were missing, like an approach to Pakistan that might work, because without Pakistan you weren’t going to get Afghanistan. And there were reasons that nobody could think of actually going in and taking out the Taliban, either the Clinton Administration or the Bush Administration, because it’s true you couldn’t get basing rights in Uzbekistan and that was the long pole in the tent. So I would make the divide September 11, 2001 when the attack on this country mobilized us to fight the war on terror in a very different way. But the notion that somehow for eight months the Bush Administration sat there and didn’t do that is just flatly false. And you know, I think that the 9/11 Commission understood that. QUESTION: So you’re saying Bill Clinton is a liar? SECRETARY RICE: No, I’m just saying that, look, there was a lot of passion in that interview and I’m not going to – I would just suggest that you go back and read the 9/11 Commission report on the efforts of the Bush Administration in the eight months, things like working to get an armed Predator that actually turned out to be extraordinarily important, working to get a strategy that would allow us to get better cooperation from Pakistan and from the Central Asians, but essentially continuing the strategy that had been left to us by the Clinton Administration, including with the same counterterrorism czar who was Richard Clarke. But I think this is not a very fruitful discussion because we’ve been through it; the 9/11 Commission has turned over every rock and we know exactly what they said. January 25, 2001 Richard Clarke Memo: "We urgently need . . . a Principals level review on the al Qida network."